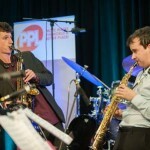 On Wednesday 21 January the All Party Parliamentary Jazz Appreciation Group (APPJAG) and music licensing company PPL hosted a prestigious event at Portcullis House, House of Commons, inviting talented young jazz musicians to literally blow their own trumpets in front of an audience of MP’s and esteemed members of the music industry. 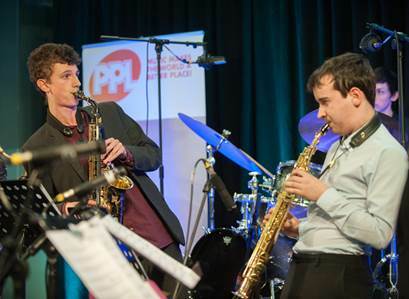 With support from PPL, each year the event, Youth Jazz, offers a different youth ensemble the opportunity to collaborate with a major guest artist culminating in a live performance at Portcullis House. This year, members of the National Youth Jazz Collective (NYJC), an exceptional jazz band made up of eleven young people from across the country, performed with internationally renowned bassist Dave Holland. 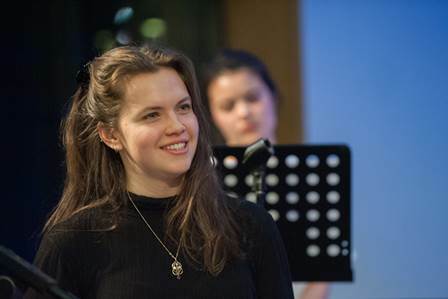 Jessica Mistry (Indian flute), 19, from Surrey, Ella Hohnen-Ford (vocals), 17, from London, Alex Ridout (trumpet), 16, Bucks, Jake Labazzi (trumpet), 17, a student at special music institution, Purcell School, Hertfordshire, Alexander Bone (alto), 18, from County Durham and a student at Chatham’s School of Music, Tom Smith (alto sax), 19, a student at the Royal Academy of Music, Asha Parkinson (tenor sax), 15, Kent, Nick Fitch (guitar),18, from Norwich and a student at Guildhall School of Music and Drama, Daisy George (bass), 18, also a student of the Royal Academy, Stephanie Wills (piano), 19, from Essex, and Adam Woodcock (drums), 19, also from Essex, played Pass it On, NYJC’s signature tune, alongside Dave Holland. 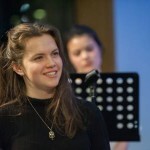 Founded in 2006 by its CEO and Artistic Director, Issie Barratt, in collaboration with a roster of over 40 world class jazz musicians and educators, the National Youth Jazz Collective is a vibrant organisation that supports the creative and educational needs of young jazz musicians providing pathways of progression from beginner to emerging professionals. Dave Holland, an English composer and bandleader, widely known as one of the best bassists in the world today has been performing and recording for over five decades. Launched to notoriety for his works with jazz legends Miles Davis and Herbie Hancock at the age of 22, Holland went on to have a globally successful solo career which continues today and has been at the forefront of jazz in many of its forms since his earliest days. APPJAG has over 100 members from the House of Commons and House of Lords, across all political parties. 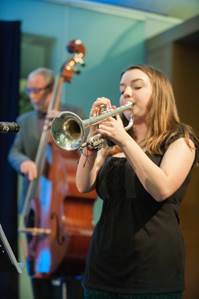 Its aim is to encourage a wider and deeper enjoyment of jazz and to increase the understanding of the jazz industry and issues surrounding it. Through lobbying at UK and EU government level, APPGAJ also campaigns on causes such as music licensing laws, funding for jazz, copyright laws and the need for more allocation of time on radio for jazz music. 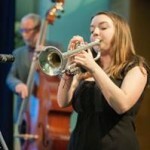 PPL supported this year’s APPJAG Youth Jazz event. The organisation works on behalf of over 90,000 record companies and performers to license recorded music played in public, so that those who invest their time, talent, and expertise in recording music are paid fairly for their work.